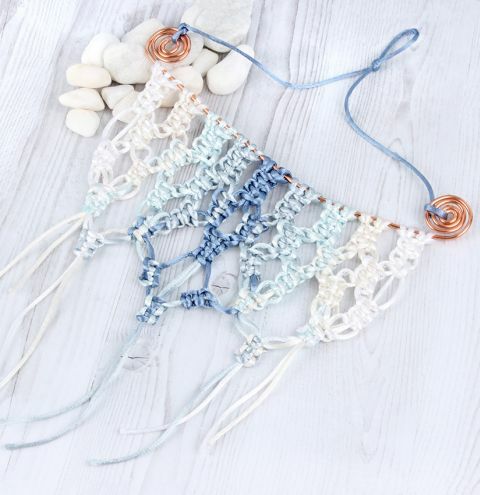 Learn how to make a trending macrame wall hanging using rattail cords in airy tones! The following project makes a small decorative wall hanging measuring approx. 20cm wide x 30cm long including the hanging cord at the top. If you would like to make a longer wall hanging, you will have to start with double the lengths of each cord and will create more macrame knotted sections with larger dangling threads. Use more cords to make a wider wall decoration. There are images on some of the following steps to help you with the pattern. You can also zoom in and look at the main image of the design to see the pattern further. Take one of each of your 5 colours of cord. You can choose your own colour combination or use the colours we have used from our packs of thread. You will have plenty of thread left over to make more variations. Seperate out your lengths of cords and cut them into 3 x 3rds. You will need 4 strands of each colour - you will need to cut an extra 3rd from your second pack of cord. Cut a length of aluminium wire measuring approx 20". Take one length of white cord and fold it in half. Fold over the wire and pull the two ends of cord through the loop over the wire. This will secure your cord to your wire with a knot. Take your first 4 white cords on the left and bring the two middle ones together, leaving an white cord on either side. Use your 2 middle white cords as the centre cord for your macrame square knotting. Create 4 complete square knots using the 2 outer cords over the 2 central white cords. Follow the image to see how to square knot or watch this quick video tutorial HERE. You may need to secure these sections of knotted thread with bulldog clips or pins so that they don't unravel as you knot along your design. Repeat the last step 8 more times for each set of coloured cords. See the image to see the first row. Next, start on a new lower row, starting on the left hand side again. Take your 4 white cords, seperate the two leftmost cords and place them to the side. You will knot with these later on. Take the right 2 white cords and take the left 2 cream cords (seperating the right cream cords to the side). Make a centre cord from the 1 white and 1 cream. Make 4 macrame knots over this. Repeat this to the right using your 2 left over cream cords and 2 light green/turquoise cords. Repeat this across your design leaving 2 spare white cords on the right hand side like on the left. See the image to see the 2nd row. Start back on the left side for your third row. Take the two spare white cords and the two leftmost cords exiting the 2nd row macrame knot above. Create 4 knots here using 2 cords running through the centre. Repeat this along the rest of the row, using up the 2 white cords left spare on the right hand side. See the image to see the 3rd row. For the 4th row, start to graduate inwards. Start on the left hand side. Take 8 cords coming out of the two knots above. Combine 4 central cords to run down the centre of your knots. Take the 2 remaining cords on either side and use these as you did when knotting with 2 singular cords. Make 4 knots and secure these 4 threads with a drop of glue at the back of the design. Trim these off to leave the 4 cords exiting from within the knot. Repeat this on the next 8 cords exiting your green/blue knots. Leave your dark blue knotted section on its own at row 3, instead take the 8 cords on the right of this ad mirror what you did on the left side. Start on the left again. Take 2 cords from the left and 2 cords exiting the next macrame knots that weren't glued and trimmed away. Create a knotted section using these. Leaving 2 white cords on the left, glue and neatly trim these knotting cords leaving the 2 that you knotted over. Repeat this on the right hand side of your design. Follow the image to make the remaining levels of your wall hanging design. You should be left with 10 cords hanging at the base of the design and your macrame knots glued securely. Feel free to personalise and adapt the design at this point to suit your requirements or copy the image. Take a look at your dangling cords and trim them to your desired length to make a graduated effect. Once you are happy with your design, secure it in place with spirals of wire at either end. Practice creating your wire spirals on a spare bit of wire. To make a spiral, take the end of wire and twist a small loop at the end using your round nose pliers. Take a pair of flat nose pliers and roll this in on itself so that the little loop in in the middle of the spiral. Trim any excess wire here and repeat it on the other end of your design. Finally, cut a lengt of cord measuring approx. 17" and knot a loop at the middle. Tie your cord to the spirals at each end and secure your knot with a drop of glue. Trim any tail threads away at the back of the design.